Church rummage sales are yard sales on steroids. There’s a ton of stuff in every category all reasonably priced. Everything is organized and the volunteers are pleasant. The only downside is dealing with the hordes of other shoppers, some of whom have no sense of personal space or etiquette…enough said! I am very ecumenical in my rummage sale attendance and on Saturday attended one at our local Buddhist Temple. Their sale was atypical in that it was smaller and focused on collectibles and antiques. Just my thing! I got there early and was second in line behind a guy I frequently see at these sales. We nodded at each other. (Someday maybe we’ll actually talk!) We could see into the room and I spent a few minutes scoping out where I wanted to go first, second and so on. Of course once they started letting folks in, my route was pointless as it soon became too crowded to follow. While I was heading down one table I picked up a small wood box with a bit of mother of pearl inlay. Not intricate or old. Nice enough but not for $20. As I was looking it over a woman on the other side of the table was surreptitiously watching me. As soon as I put it down, she picked it up and kept it. And that’s how it is at these sales, you gotta be quick and alert to get what you want! I continued on looking at Asian ceramic bits, kimonos, books, Russian lacquer ware pieces and more dolls. Eventually I started putting a few things in my tote: a Kenzo hanky (I’ll add this to a hanky lot), a vintage scarf of Asian men working, a small ceramic box in the shape of a shell and a small plate from Denmark. Nothing expensive. Nothing worth much. No home runs. 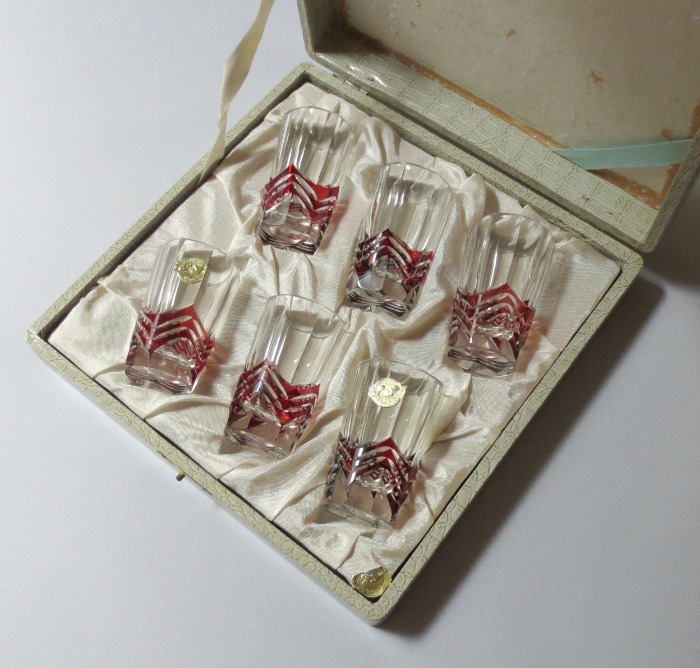 Then a box of six cut glass (edo kiriko) shot glasses caught my eye. Wow. Oh jeez. These were so handsome and in pristine condition. Several still had their foil sticker “S Y (? ), Tokyo.” I was surprised these hadn’t been nabbed yet. These were, without a doubt, the best item I would be buying today. Just fabulous. I wanted to buy a set of five gray handmade soup/rice bowls. I saw them stacked on a table and marked “$5.00 for 5.” Super. That’s a great deal. I started putting them in my bag and noticed that a bowl further down the stack was marked “$50.00 for 5.” Holy smokes! That’s quite a difference! When I got up to the “checkout gal” I told her there was pricing inconsistency on the bowls. She called over two of the “pricing ladies.” They both agreed $50 was too much but $5 was not enough. The bowls were offered to me at $25, but I decided to take a pass on them. Then one of the ladies said, “Maybe we should let her buy them for $5.” And I had this wonderful flash of hope. Yes, they were going to honor the $5 price tag! But the other lady didn’t agree…darn. I could have made an offer, but I really just wanted them for $5. Whether you’re buying for yourself or for resale, church rummage sales are great venues for bargain hunters. Be pleasant and courteous to everyone, especially the volunteers. I’ve witnessed people getting angry with volunteers over prices of items and that’s just not cool. 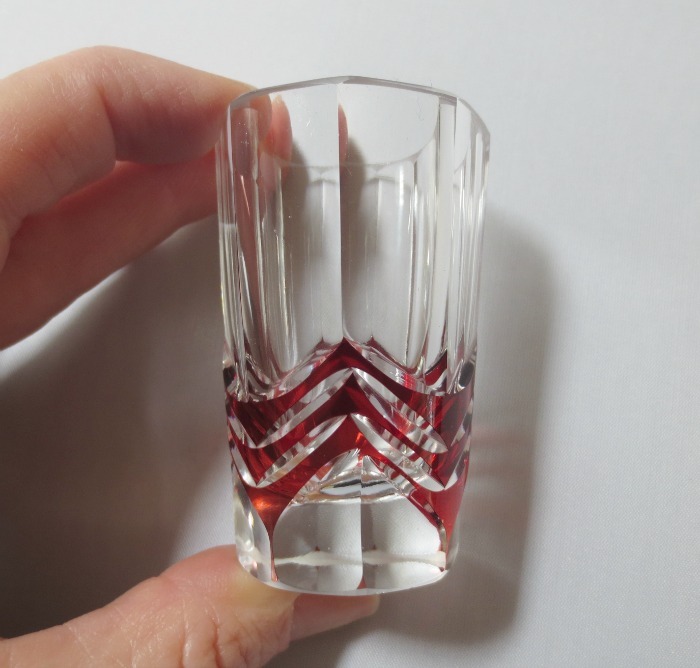 Haven’t been able to find out anything about the Tokyo shot glasses yet. You’d think it would be easy, but none of my searches is bringing up similar items or relevant information. Trying a few of my antique resources. Fingers crossed! I’m pretty sure your Asian workmen are Japanese. The fabric looks like rayon crepe. Is the piece square? It might be a furoshiki. I’ve seen several in rayon crepe, although the designs usually seem to be a bit more blandly decorative. ← A Shoebox Full of Jewelry…What Will I Find? ?